Raising bees is becoming increasingly popular in backyards and on farms large and smallâ€”and itâ€™s easy to see why. These resourceful insects produce organic honey and beeswax, all while constantly providing natural aid to the health of your yard and garden. 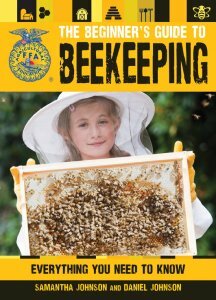 And even better, bees are easy to keep, especially with the expert instruction of the The Beginner's Guide to Beekeeping. Beginning with the basics, seasoned beekeepers Daniel and Samantha Johnson answer all of a prospective beekeeperâ€™s questions on how to set up, care for, and harvest your very own bee colonies. With the help of this comprehensive DIY guide, raising bees can be an enjoyable and accessible backyard pastime for gardeners, crafters, and cooks everywhere.